In my earlier post about Bullet Journaling, I described how I've given up all of my complicated productivity tools and returned to a simpler way of life. Well, I may have left a small part of the story out. Now, instead of fidgeting with productivity apps and gadgets, I fidget with pens. More specifically, I've caught the fountain pen bug. I can't really provide a logical argument as to why someone should choose a fountain pen over the many excellent and inexpensive gel ink pen options out there. In fact, fountain pens are kind of a pain in the neck in many respects. The fiddly, high maintenance aspects of fountain pens have become a bit of a hobby for me – a hands-on hobby that doesn't involve staring at an LCD screen. Like spending a few bucks on a great cup of coffee, writing with a good fountain pen is one of those things that defies logic a bit but provides a relatively inexpensive feeling of luxury. It's probably not for everyone, but if it sounds at all appealing, I would encourage you to give it a try. If you are new to fountain pens, it can be a bit intimidating to figure out where to start. There are, in fact, many paths and permutations to explore if you want to, but getting out of the gate with a high quality starter pen is very simple and inexpensive. You can be up and running with a very nice fountain pen for under $30. In fact, there are many options to choose from in this price range. 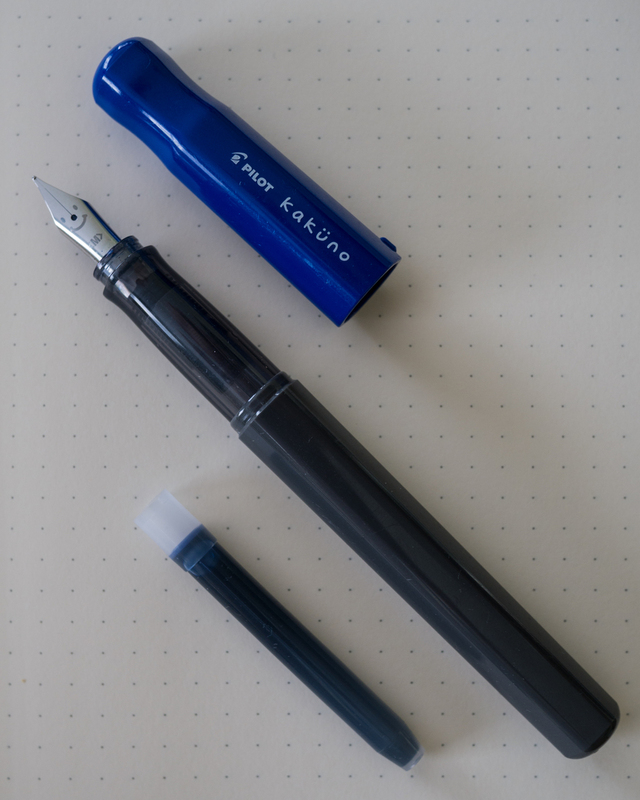 My recommended setup for a beginning fountain pen user is the Pilot Kakuno ($16.50) paired with a box of Pilot Namiki blue black ink cartridges ($4.00). You likely recognize the Pilot brand name from office supply store shelves, but they are a major player in fountain pens as well. The Kakuno is a not your typical "boardroom" fountain pen. It's a smaller plastic pen with colorful accents and a little smiley face on the nib. (The nib is the metal tip that applies the ink to the paper.) Yes, it's a bit hokey, but it's hard not to smile when you look at it. It's also a great writer that is compact and inexpensive enough to just stick in your pocket. That said, the main draw of this pen for me is the combination of an excellent Pilot nib and easy access to a great cartridge-based ink. I bought my own Kakuno specifically because of the Pilot Namiki blue black ink cartridges. I tried them in my higher-end Pilot Vanishing Point, fell in love, and wanted to be able to use them in a knock-around pocket pen as well. I will cover ink and paper experimentation, both of which I now love, in future posts. However, my recommendation is to learn to love writing with a "known good" fountain pen / ink combination first. The Metropolitan ($14.50) is a widely recommended starter pen. It provides a comparable writing experience to the Kakuno is a more traditional barrel style. I think your first fountain pen should be fun and distinctive to look at, and the Metropolitan doesn't push either of these buttons for me. However, if you want something more conservative looking than the Kakuno it is worth a look. People with boring looking fountain pens are still cool in my book. Lamy is a well-respected German pen maker, and the Safari is their entry level offering. It has a plastic barrel that you can find in both bright and understated colors. The Safari is a great option if you think you might want to jump right into tinkering. You can buy replacement nibs in varying sizes, and they are very easy to swap in and out of the pen (even when then pen is inked). The Lamy Vista: a clear plastic "demonstrator" pen. The Lamy AL-Star: similar style of Safari in aluminum for around $10 more. These are great pens with a cool and distinctive design. Lamy also makes a decent blue black ink cartridge. However, I find the Kakuno / Pilot blue black combo much more consistent across the various paper qualities I encounter. If do you go the Lamy route, I would recommend starting with a fine nib, which lines up roughly with the Pilot medium. As a fountain pen novice, I didn't really know what to expect in terms of how messy using fountain pens would be. Things can certainly get a bit messy on occasion once you begin inking your pen from a bottle. However, I've been amazed by how little drama I've encountered otherwise. I've been knocking fountain pens around in my pocket daily for months, and it's always fine. Throw your fountain pen in your pocket and use it everywhere. When the store cashier slides a credit card receipt over and tries to hand you a chewed up Bic, scoff and pull your own pen out of your pocket. Coffee snobs are a dime a dozen. Pen snobs are much more novel. Pilot CON-50 converter ($8.25): This will allow you to adapt your Kakuno (and other Pilot models) to use bottled ink down the road. Platinum Preppy fountain pens ($3.30/each): You won't regret picking up a couple of these to play around with different colors and nib sizes. You can find the Pilot Metropolitan and Lamy models at JetPens as well. However, you may also want to check Amazon if you are a Prime member. You may see the Kakuno on Amazon as well, but I found it to be less expensive on JetPens.